WWF WrestleFest arcade board, ATX power supply, supergun, and Neo Geo controllers. Note 1: Like wrestling games? Check out my reviews of Saturday Night Slam Masters, Muscle Bomber, and 3 Count Bout! 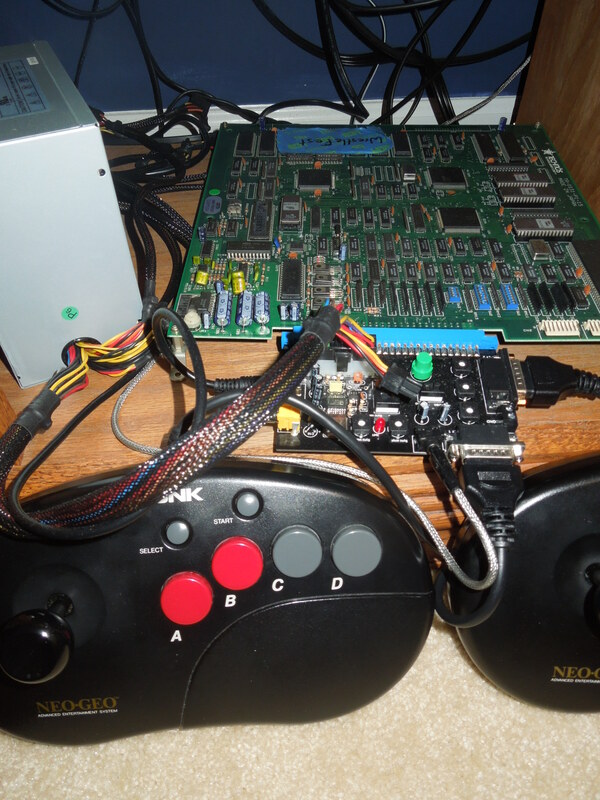 Note 2: This game (arcade board) was played on a home-made supergun (a device used for playing original arcade boards on a tv) using S-Video cables. The supergun was connected to a 32-inch HD tv. 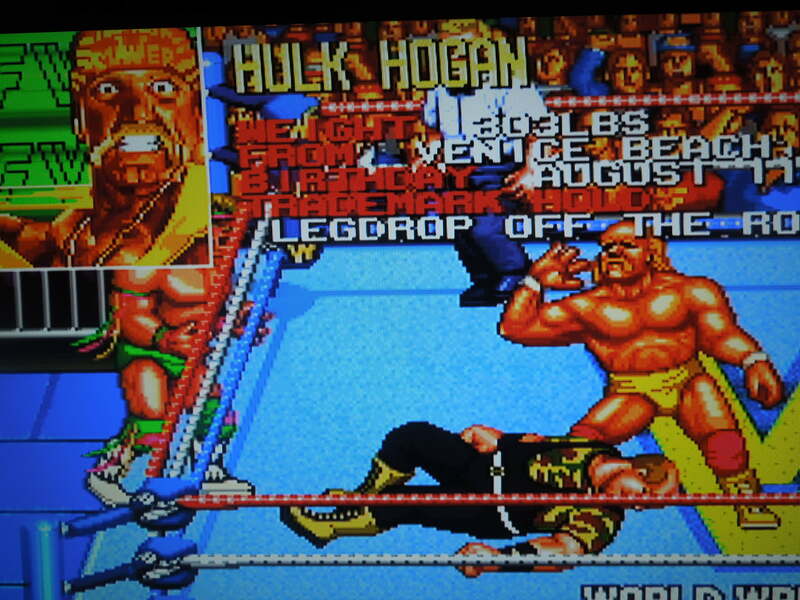 *Ok, so WWF WrestleFest is probably the least ‘obscure’ game I’ve reviewed so far. Chances are pretty good that if you like video games, you’ve either played or heard about WrestleFest. However, because the game was only released for arcades and has never received a home console port, I’m putting it in the ‘obscure’ category. Plus, it’s just so awesome I had to put it on here. Enjoy! 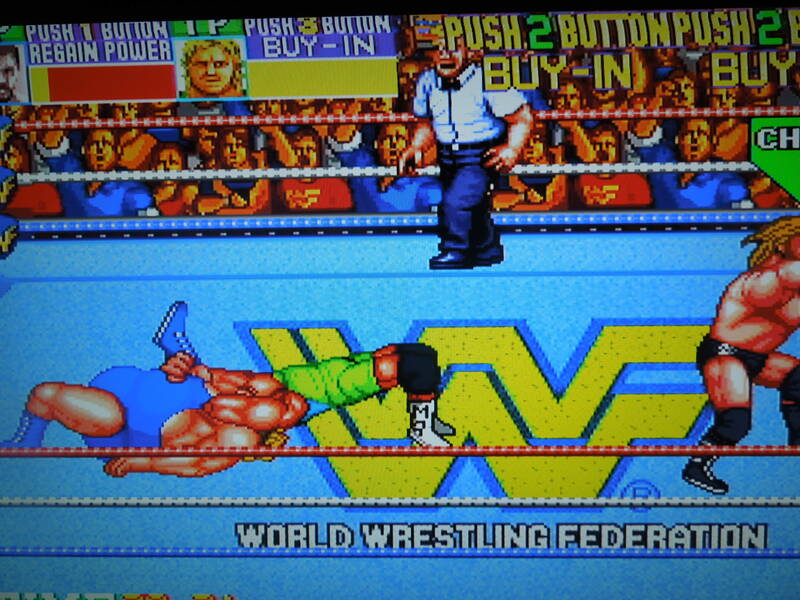 Quick History: WWF Wrestlefest was released for arcades in 1991. It starred some of the biggest names in wrestling for its time, like Hulk Hogan, the Ultimate Warrior, and Mr. Perfect. The arcade board/pcb of WrestleFest is a standard ‘jamma’ board (Japan Amusement and Marketing Machine), basically meaning it could be plugged into and played in most arcade cabinets then and today. The game supported up to 4 players if connected to a 4-player arcade cabinet, but often times arcade boards were placed in the more common 2-player only arcade cabinets. The supergun that WrestleFest was connected to for this review supports 2 players, and thus the game board/pcb has been set for 2 players. As popular as the game was with arcade-goers, it never received a port to any home console, such as the Sega Genesis or Super Nintendo. Modes: WrestleFest has two modes of play to select from: Saturday Night’s Main Event (Tag Team Mode) and Royal Rumble (Battle Royale). Tag Team Mode: You select 2 wrestlers (or you select 1 and a friend selects the other), and you fight 4 or 5 tag matches, depending on what the game board is set to. The final tag match is against the WWF Tag Team Champions, the Legion of Doom. If you beat the LOD, you must once again play 4 or 5 matches, again culminating with a title defense against the LOD before you beat the game. There is some strategy involved in Tag Matches – it’s smart to tag often, as a damaged wrestler will regain energy while on the outside of the ring. Also, whenever a pin attempt is made or a submission hold is put on a wrestler, the two partners on the ring apron will hop in the ring to try to break up the hold or pin/keep the other partner from breaking up the hold or pin. Special tag team moves can be executed if you tag your partner while you have your opponent in a head lock or lying prone on the mat near your tag-corner. You can play 2 player co-op tag matches against the computer, or you can go head to head with your tag team vs your friend’s tag team. The winner of the 2 player VS match will continue on against the computer, unless the loser elects a re-match. Choose from 10 WWF wrestlers from the 1990s. Royal Rumble: The Royal Rumble is a 12 man Battle Royale. 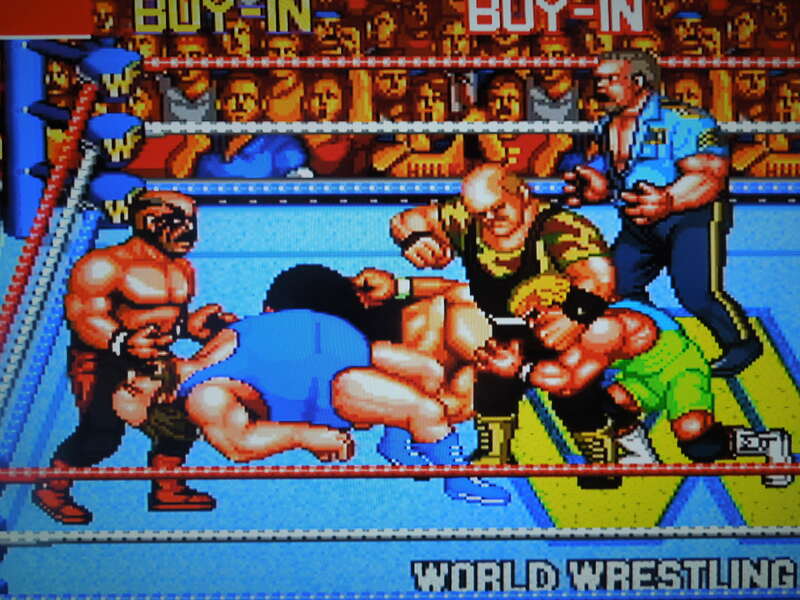 You start (or you and another human player, as this mode supports 2 players too) with 6 wrestlers in the ring. It’s every man for himself, and the goal is to throw the other wrestlers over the top rope, pin them, or make them submit, all while trying not to get yourself eliminated. Every time a wrestler is eliminated, another comes to take his place until all 12 wrestlers have been in the match. The last man standing wins. Use foreign objects when fighting outside the ring. Controls: WrestleFest has simple controls. Because my supergun uses Neo Geo control sticks, that is how I will describe the controls. A tags your partner in Tag Mode (go to the highest point near the turnbuckle). A punches when standing. Tapping A in a grapple wins the grapple and executes a pre-determined wrestling move, like a body slam. The move you perform as you win grapples changes throughout the match – at first you’ll execute simple moves, like snap-mares, but after you weaken your opponent, you’ll execute stronger pre-determined moves, like pile-drivers. B kicks. Tapping B in a grapple whips (sends him running) the opponent across the screen, where they will bounce off the ropes and run back at you (or hit the steel cage bars in that particular match). When an opponent is running at you following a whip, hitting A or B executes a wrestling move, like a drop kick or back body drop. Pressing A + B makes your wrestler run, and following it up with A or B executes a wrestling move, like a flying clothesline or running knee smash. When an opponent is down, pressing A around their mid section kicks them, pressing A+B puts them in a submission hold, like a Boston Crab, pressing A by their head picks them up, and pressing B covers them for a pin. You win a match when your opponent is pinned for a 3 count or gives up from a submission hold. Your character has an energy bar that depletes during the match as you take damage, and pressing Start (if you have repeatedly pressed the ‘insert coin’ button on your supergun or arcade cabinet and have extra credits) refills your energy bar. Finishing Moves: Each wrestler has a finishing move that is easy to pull off. All you have to do is wear down your opponent first. Then simply keep tapping A when in a grapple to pull off most wrestlers finishing moves (ex. The Perfect-Plex with Mr. Perfect or DDT with Jake ‘The Snake’ Roberts). Other finishing moves are executed when your opponent is lying prone on the mat after you’ve beaten the heck out of him (ex. Hulk Hogan’s Atomic Leg Drop, Earthquake’s Earthquake Splash). The Boss Man’s finishing move is unique in that you have to whip the opponent into the ropes, let him come back to you, then simply press A to execute the Boss Man Slam. DIP settings: The arcade board/pcb of WrestleFest has DIP settings (very small, white numbered switches) that can change the game’s settings. You can find a free viewable copy of the manual online to see what switches do what. Basically some things you may want to change would be the difficulty (four levels of difficulty), or the total number of players the game allows for (if your arcade cabinet or supergun is designed for 3 or 4 players, for example, you’ll want to make sure that DIP switch is set to 3 or 4 players). 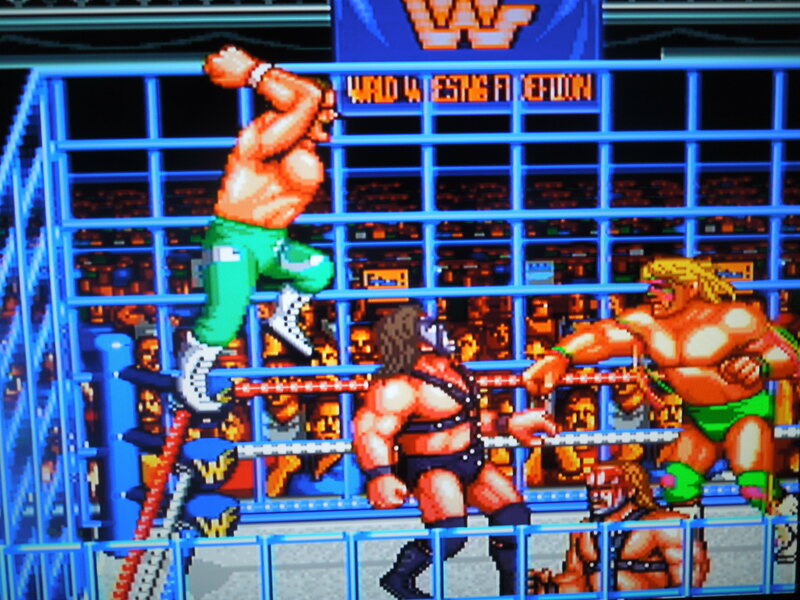 Rings, Cages, Turnbuckle Attacks, and Fighting Outside the Ring: You’ll play in different colored rings as you progress through Tag Mode, and the Steel Cage is particularly awesome. You can do incredible damage to your opponent by whipping them into the cage. You can also climb the top two turnbuckles in any match, and come flying off with an atomic elbow or big splash. 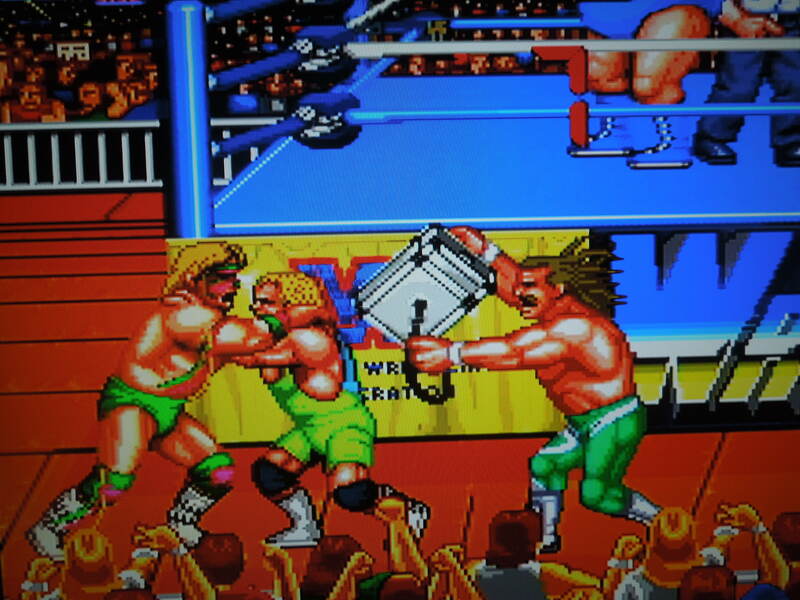 Also, in regular matches, you can throw your opponent outside the ring, where you can whip them into the steel rail, or pick up the steel steps or a metal box and smash them with it (just make sure you get back in the ring by the 20 count or you’ll lose the match – the computer can also get counted out). The Legion of Doom awaits your challenge. Music & Sound: A somewhat catchy tune plays during the matches. The sound effects work great. Punches, body slams, and the cheers and boos of the crowd give the game that ‘arcade’ feel. There are also many voice-overs, including the names of the characters. An announcer ‘calls’ the match by basically saying what wrestlers are doing what moves. Sometimes it’s easy to hear what he says, like “Hulk Hogan – Atomic Drop!” but some are harder to understand. Characters: The 10 selectable characters are: The Million Dollar Man: Ted Dibiase, Big Boss Man, Hulk Hogan, Jake “The Snake Roberts,” The Ultimate Warrior, Mr. Perfect, Earthquake, Sergeant Slaughter, Smash, and Crush. In Tag Mode, you have to pick Smash and Crush together (as they form the tag team ‘Demolition’). 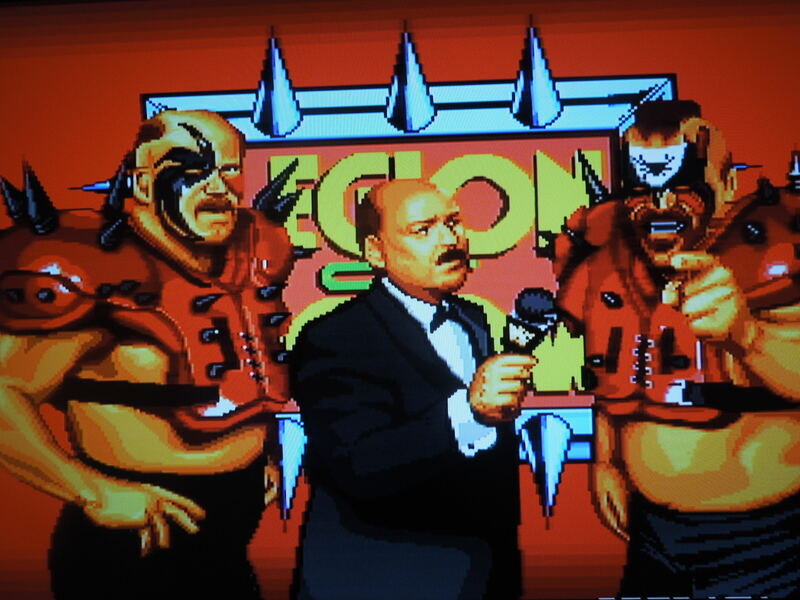 You cannot select the Legion of Doom wrestlers, unfortunately, although they do appear as opponents in both the Tag Mode and Royal Rumble. Some wrestlers move faster (Mr. Perfect), while some move much slower (Earthquake). All wrestlers perform signature taunts, but unfortunately, as a human player, you cannot execute a taunt – only the computer can do this after they hit a big move on you. Each character also has their own unique set of pre-determined grapple moves, submission moves, or running attack moves (although multiple characters often use the same moves, no two characters have the exact same move list). So, where can I find this game? You can find the pcb (printed circuit board/arcade board) on eBay. You’ll need a jamma-ready arcade cabinet (most cabinets are designed for jamma boards like WreslteFest) or a home-made supergun that supports jamma boards in order to play it. I ordered my supergun on eBay as well. Unfortunately, WrestleFest has never been released in home console disc or cartridge format, nor is it available for download on popular modern-day gaming services like the Playstation Network. You can play the rom on a computer emulator. If the LOD hits the Doom’s Day Device, it’s lights out. Conclusion: WrestleFest is an example of a game that is better (for it’s sport) than anything that has come out since. It’s easy to pick up and play – there are no complicated controls to frustrate you. And two-player co-op? It’s one of the most fun co-ops in all of gaming. Being able to select the difficulty on the DIP settings is great – the challenge of the game is to try and beat all the tag teams without having to hit the Start button to regain life (you’ll automatically re-gain some life after winning a tag match, by the way). The LOD tag team can be quite tough, and some skill and strategy is involved in order to beat them. 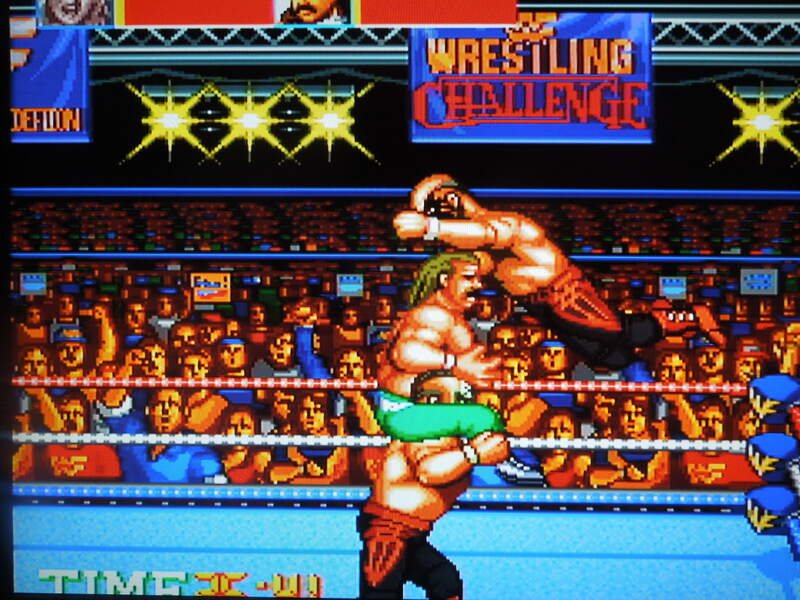 This entry was posted in Arcade - WWF WrestleFest and tagged WWF WrestleFest Review (Arcade). Bookmark the permalink.